Warning: Do not swing or rock back and forth as you perform this exercise. Doing so can cause lower back injury. Connect a V-bar attachment to the low pulley on a cable station or cable rowing machine. Sit down at the station and place your feet on the foot pads or crossbar provided, while keeping your knees slightly bent. 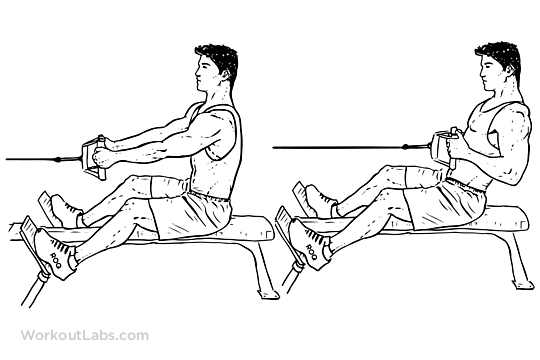 Keeping your arms fully extended pull back until your torso is at a 90-degree angle from your legs. Your back should be slightly arched, with your chest should be pushed out. This is the start position. Keeping your torso stationary, pull the handles back towards you while squeezing your back muscles. Keep your arms close to your sides until your hands reach your abdomen. Exhale as you perform this movement. Inhale as you return to the start position in a smooth movement. Note: You can perform this exercise using a straight bar instead of a V-Bar.